A proud brown female rapper, Hyclass has hit the public with a soulful jazz and funk inspired single ‘Queen’. Three years after dropping her first mixtape I NEED U, Hyclass has become a renowned name in Perth and by listening to her music you can see why. Her live performance on the 8th of September was even more impactful, alongside artists Natalie Mae, Young Jaycee and Premiss who backed Hyclass. The night started out with the soulful Natalie Mae, serenading the early audience with emotional hip hop/RnB and jabs of stand-up comedy. The wave pad vibe of most of her music was very relaxing over layered by her soulful voice made for a perfect opener. Not to mention her DJ Rae who had some hectic bars to spit. Coming up in Perth, Young Jaycee was in second dropping fat 808 kicks and rhythms comparable to well known American wordsmiths. A personal favourite of mine from Young Jaycee is his song ‘Lala’ an instant club banger with a catchy melody and instrumental, keep an eye on his music. Between all of these tremendous performers were some lit DJ’s on the ones and twos, carrying in crates of vinyls and laptops were Rok Riley, ASLAN and DJ Stylz Ali making sure the party was still teeming with excitement and chatter for the last act. Finally, after an over due wait and a full crowd Hyclass steps onto stage with an eight-piece band, horns blaring, the grooviest rhythm section and a funky drummer ready to cause havoc. Hyclass then jumps on stage alongside Natalie Mae, bringing so much energy that Mojo’s couldn’t handle. With Premiss backing the both of them the night had gone into full swing and soul was pouring from every corner of a room filled with singing and dancing. My personal favourites from Hyclass, apart from ‘Queen’ include ‘Down Homie’, ‘Write Your Name’ and ‘Who Want It’ all of which I was glad she performed, intertwining old school samples pulling the old school and the new school together. I was personally so impressed by the knowledge Hyclass was dropping between songs, talks being a brown female rapper, talks of appreciation of her family, appreciation of her culture and appreciation of hip-hop culture all of which I resonated with strongly. 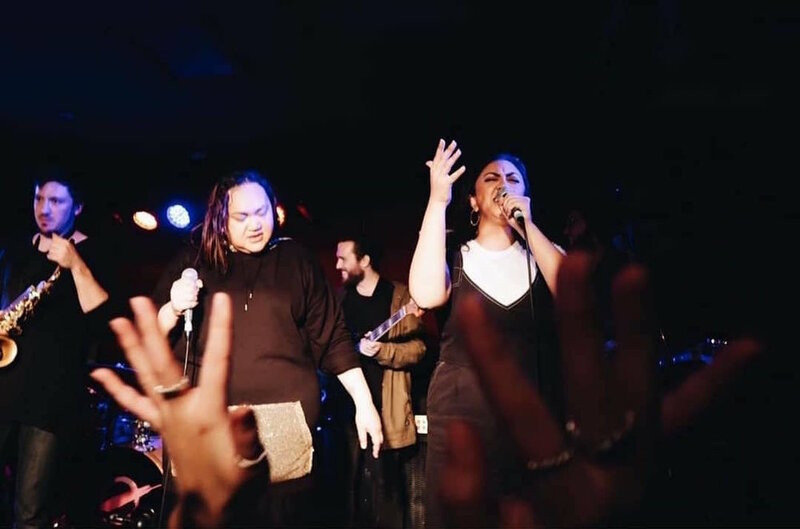 All in all, the night full of expression and soul from Natalie Mae’s honey butter voice, Young Jaycee’s up-tempo flow and of course Hyclass’ transcendence to her audience and listeners.